This topic contains 28 replies, has 2 voices, and was last updated by Hudson Atwell 1 month, 3 weeks ago. My funnel consists of 3 steps. Step 1 leads to Step 2, Step 2 leads to a third and final page. If we would like to track the performance of landing page variations for Step 1 and variations for Step 2, what is the best way to pass the unique conversion shortcode from the landing page variation served in Step 1 to whatever landing page variation is served in Step 2 so it fires on page load and we can record the conversion? Good question, I’ll see if I can help. I bet there are a couple of ways we could solve this. I’ll start with a few questions. Does the user arrive at step 2 via Form submission or via clicked link? And for Step 2 to Step 3? Does the transition occur from form submission or from link click? Are you able to edit the PHP code of your variations? Is it possible you could link me to Step 1 privately? https://mydomain.com/go/step2/?origin=0, where 0 is the variation ID of Step 1. If all works well the correct variation for Step 1’s landing page will show an increased conversion count. 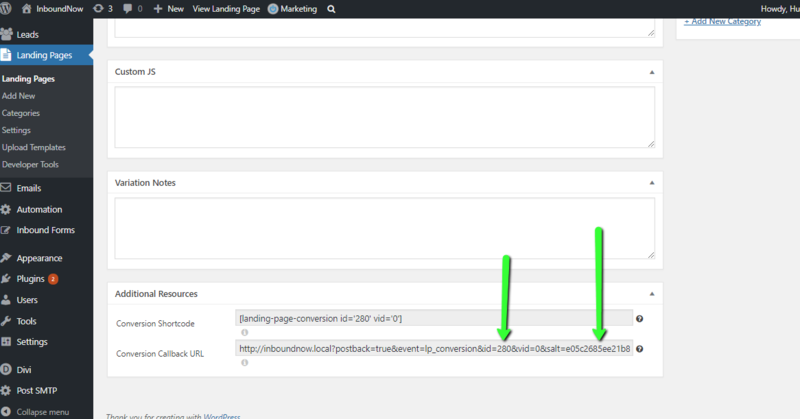 If no ?origin=vid is present then it won’t increment any conversion counts. Is the variation ID (vid) hard coded? The issue is that Step 1 may have multiple variations and Step 2 will have multiple variations. Hard coding a variation would not work. There is a measure of hard coding, but it should not be hard to implement, and you will not have to edit template code, only add JS code into the metabox area named ‘Custom JS’ that’s available when editing any landing page variation. In Step 1, for each variation, make sure that each link leading to Step 2 contains the ?origin=vid (replace vid with the variation ID of the Step 1 page). Then on Step 2, in all your variations, paste the JS code above into the Custom JS metabox. Now whenever a Step 2 page is loaded it will read the ‘origin’ value from the URL and send the conversion callback, incrementing the correct variation for Step 1. Yes everything looks correct. I tested the Step 1 to Step 2 transition and the callback fired once and reported a success message. There should only be one increment. Will you clear stats and try again, just to make sure? The topic ‘[Pre-Sales] How to pass the conversion shortcode to other landing pages’ is closed to new replies.